Glazing your ceramics serves several purposes. Not only does it add a safe sealed coating to your bisque fired wares–making it waterproof and food safe–it also brings your work to life with any color you wish to create. The possibilities of glazing are endless and the techniques and patterns you can create with them have no limit. Glazing can take an ordinary ware and make it a work of art. However, with all that possibility also comes a lot of decision making. As glazes are made up of chemicals and compounds, each of them reacts to the different materials and clays in different ways. The beauty of this is that every piece you create will be completely unique. We're going to cover glazing pieces which have already been bisque fired, as single fired work is usually used more for decorative ceramics than functional wares. 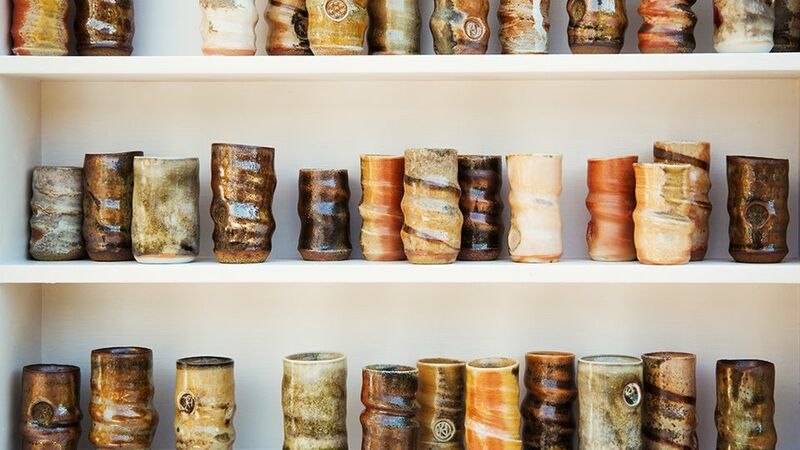 What Types of Glazes Can You Get? Types of glazes run the gamut, but if you’re looking to break them down into very basic categories, then here are a couple of examples: Gloss glazes create a very shiny and reflective surface (note that if you want to photograph your pieces, then gloss can be tricky to obtain a good effect with due to reflection of the shiny surface). Matte glaze is pretty dull and doesn’t reflect the light; the glaze is quite transparent, but still has a little bit of a shine. There are varying levels of opacities but matte glaze can be a great type of glaze to start with for beginners. What Are the Basics of Glazing? Glazing can make or break a pot, so it’s great to spend a bit of time planning the exact look, feel and color of what you want to achieve. All glazes and clays have different properties; so bear this in mind before you start. There are two main ways you can glaze: dipping your glazes or brushing them on. If you’re glazing the insides of your pot, then pouring is the best option. For first time glazing, dipping can be the easiest and most effective way, as it tends to be the smoothest way of glazing (brush work is often a little more complex in that you have to be very neat in terms of not leaving brush marks on your work). When you’re glazing, your bisque fired work needs to be as clean as possible, so make sure you remove all dust before you start with a clean sponge or lightly damp cloth. Next, your glazes need to be mixed as well as you can, as when glazes are left to settle in a bucket, the heavier sediments sink to the bottom. The whole glaze will need to be mixed properly to take on a smooth, even consistency before you dip your pot in. Test glazing can be a laborious but necessary process. Given all the different ways different clays can react with different glazes, it’s important to know what you're getting. Once your ceramics have gone through their glaze firing, they’ll be vitrified and the process will be irreversible. The easiest way to make up your test glazes is to make a series of different ceramic tiles in the different types of clay you’ll be working with. Once they’ve been through their first firing, then you can test out your glazes on them. The single most important thing about your test glazing is that you properly record everything that you do, so that you can recreate it when it comes to glazing your finished work. Test glazing can also be your time for playing and experimenting. Try different colors together, different clays and layering up glazes and oxides. Try dipping, brushing and splattering glazes to see what effects you really like. What Are the Ingredients in a Ceramic Glaze?